This is a report which was send to us by an independent support collective in Belgrade. It testifies a massive nightly police operation on November 10th in Belgrade, which lead to mass evictions and transfers towards the Southern Serbian border where illegal push-backs have become normality. This testimony is an important addition to our recently published report „Bordered Lives – Unbound violence“ on migrants‘ situation in Serbia. 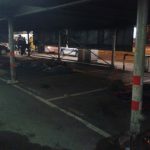 On November the 10th in the middle of the night, a big police operation took place behind the main bus station in Belgrade and the parking lots near the so-called “Afghan Park”. 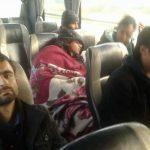 109 people were put onto buses and brought to the closed camp in Preševo near the Macedonian border. From here, people are being pushed back on a constant basis. Behind the bus station at the moment more than 700 refugees remain in empty warehouses and around 30 people are currently sleeping in the parking where night temperatures are at an average of 1 degree. During the whole operation, although the people were very scared, they stayed remarkably calm and peaceful. Police did not use actual physical force, but were sometimes deceitful towards the refugees by threatening them and lying over the bus’ destinations in order to get them to move from the park. 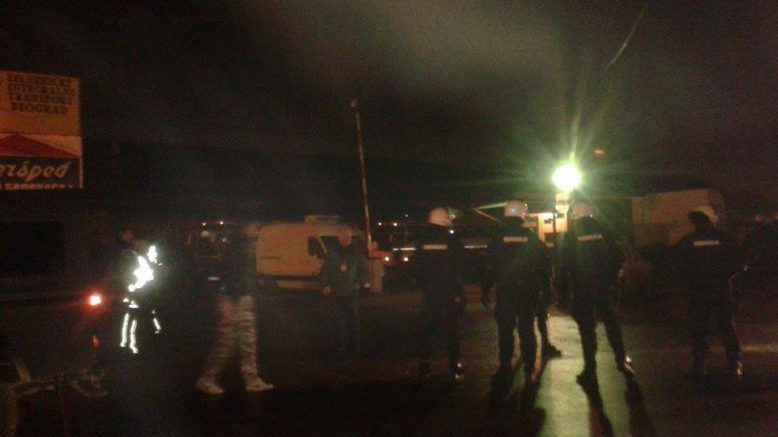 From around 3.30am until 5.50am there was police, civil police, SAJ (Special Anti-Terrorist Unit), Commissariat, Intervention Brigade and Gendarmerie roaming around the two of three main sleeping places of the refugees in Belgrade, trying to persuade them to get into the buses. It is estimated that the forces amounted to 300 individuals, altogether. Most of them were wearing helmets and shields. The majority stayed in around the warehouses behind the main bus station but there were also a few in the parking lots next to Afghan Park. There was however no Police presence in the parking lot near the Info Park, where around 120 people sleep. This, most probably in order to keep the action silent and without publicity, as the parking lots are the most visible spots and as in the parking next to Info Park a bigger number of people sleep. Different methods of getting the people out of their living quarters were used. 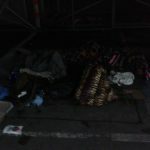 In the parking they got woken up rudely and were kicked, but fortunately according to the people most refugees left hastily, leaving all their stuff, before being surrounded and thus meaning that nobody was taken. In the warehouses, some groups were woken up by civil policemen who asked for somebody who speaks English, questioned if they wouldn’t prefer to go to a camp considering the current weather conditions and the fact that in the next days the buildings would soon be torn down. They said they would bring them to Preševo Camp and when asked, they promise they would not get deported as long they remained peaceful. Others were told that they would get transported to a camp, unclear which one, but were promised a good and open space. They were told that if they refused, they would be all deported to Macedonia. 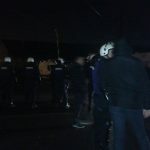 This all happened while the police and SAJ completely surrounded the complex of warehouses. Members of the UNHCR were part of the negotiations with the migrants also, as they were the only ones allowed to enter. For the few NGOs present, the only possibility to observe the events was from a distance of 50 meters away. Outsiders were given no statement about the whereabouts of where refugees would be brought, nor given any information about the entire operation. Instead police simply noted personal data and pushed people away who were trying to get closer. Many refugees came out of the warehouses to see what was happening, others, as they were terrified and in order to escape and to hide, got on one roof or left the area while it was still possible. After a while, people were told to leave the buildings and waiting outside – in middle of the night with temperatures bordering 2 degrees. Inside the buildings people made many small fires for heating. At some point, blankets were thrown on some of the fires – the windows were ablaze with light and smoke rose up. Only one fire engine was present. It was thankfully not needed in the end. It should be noted that the refugees, despited being attacked in this manner, remained calm, only giving out sporadic shouts. Next to the 300-men police chain, there were eight buses parked and one next to the Afghan Park. Six of these drove away empty, minutes after 5am. Three of them went half full containing a total of 109 people. One family was confirmed present, the rest were unaccompanied men and some minors. Only very few left voluntarily, the rest were forced by the polices‘ threats. Those in the buses arrived in the late morning in Preševo and were registered there. The camp was previously told to be prepared to register 600 new people. 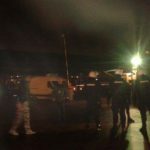 In light of this fact, and the of the huge effort that was planed to be made, in order to take in a lot of people, it is likely that the police will continue to raid the camps in Belgrade in the coming days. 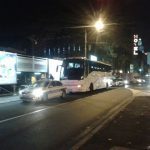 According to the Commissariat, the UNCHR organised the buses (from the company “Lasto”). After the buses left, the tension was slightly relieved. Some people were again able to move in and out of the building. But as the people tried to come down from the roof, some fell down and injured themselves. This left people with broken legs and one with a broken arm and several other light injuries. It is worth mentioning that during the whole action there was no emergency nor medical support and help came only once it was privately called. MSF showed up and provided medical help after the police were gone. At approximately 5.40am and with the early signs of daylight, the first media channel showed up, conveniently just a moment after the flights of policemen and buses had left. General information was given about what had just happened and questions were asked about what could happen in future, considering the current situation in Belgrade. Comparing the atmosphere of the March of hope in July from Belgrade to the Hungarian border with the camp Horgos in July 2016 when people shouted “Thank you Serbia”, wrote “Thank you Serbian police” on their cheeks and said: “Bulgaria, Hungary – big problem, Serbia good!”, the situation has now changed completely. One refugee said: “It is dangerous everywhere: in camps, at the borders, in Belgrade. Serbia is a big problem for us”. 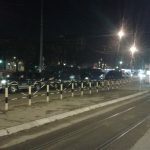 It is a well-known fact that since the beginning of when migrants stayed for longer periods of time in the city of Belgrade, it has been an inconvenience for the government. As they often do not stay in camps, people on the move in Belgrade are either in public parks, in squatted old warehouses or in parking lots. Therefore, they are not only visible but hard to control. In this regard, there have been different attempts from the authorities to reduce the numbers of migrants in the city, such as, in the end of October, revoking the permission for distributing food, and the latest and most direct one, the partial eviction of the main living space of the migrants. Considering the rapidly falling temperatures and the fast-approaching winter, it is the government’s and NGO’s target to place everybody in camps.